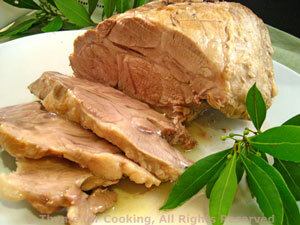 Braised Pork Loin, with Bay, Thyme for Cooking easy winter main course. After turning pork, add sliced onions to brown as well. Add remaining ingredients, turn heat to low, cover and braise for 1 1/2 hours. Strain juices, then return to pan. Reduce pan juices over high heat until slightly thickened and syrupy. Slice pork, pour pan juices over and serve.